Myocarditis — inflammation of the myocardium, the muscle layer of the heart, arising as a rheumatoid or rheumatic, allergic, toxic and infectious process. Manifested cardiac and general symptoms, a severe course and serious complications until the disability. Often is a complication of a viral or microbial infections. Occur at any age, but most often in infants after scarlet fever, diphtheria and influenza. Approximately half of patients can occur in asymptomatic or abortive form, although it may be a serious illness leading to death. Infective myocarditis occurs as a symptom or complication of infection. It may in severe cases lead to death. Myocarditis is a manifestation of systemic disease. Then it occurs as an autoimmune damage heart tissue in rheumatism and rheumatoid processes vasculitis. Separately allocated allergic myocarditis as a result of taking medication, exposure to allergens aerogenic or foodborne. Toxic myocarditis occurs as a result of poisoning by alcohol, drugs, as a result of exposure to radiation and irradiation. A separate option is idiopathic myocarditis or myocarditis Fiedler-Filatov. It is of unknown etiology. Proceeds malignant and extremely fast. The pathogenesis of myocarditis is complex and multi-layered. This may be a direct effect of damaging agents on cardiomyocytes, as well as the formation of auto-aggression to the cells of the myocardium, when the body begins to perceive them as alien. When allergy myocardium may be damaged by circulating immune complexes that cause inflammation foci in the myocardial tissue, increased permeability of small blood vessels and a violation of myocardial function to ensure adequate blood flow. As a result, the myocardium is increased in size and weight, especially in the left ventricular cardiac contractility and disrupting its conductivity. May occur as isolated lesions of the heart attack, and its combination with endocarditis, or pericarditis. The outcome of inflammation could be cardio replacement of functional tissue in the connective tissue. This forms a circulatory insufficiency, cardiac arrhythmias, severe violations of the state, especially in children, and often fatal due to progressive heart failure. Myocarditis classified according to different principles. Based on the fact, which indicator is taken as a basis. The symptoms of myocarditis, and the degree of their severity depend on the form and degree of severity of the myocarditis. The disease usually occurs after a previous infection or poisoning, in case of allergies. Symptoms include contractility disorders, cardiac conduction and excitability and complex common symptoms resulting from blood circulation disorders. 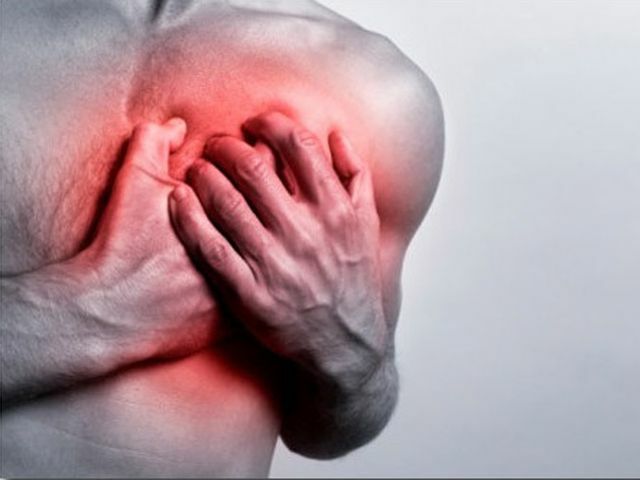 The first signs of myocarditis — the emergence of severe weakness, fatigue, shortness of breath with minor occurrence of physical activity, heart pain sharp or aching, pressing character. There may be bouts of palpitations or sensations disruptions in the heart, enhanced sweating, aches and pains in the joints, trembling. Maybe join a low temperature, the pressure is reduced, signs of circulatory failure, and an increase in heart size. Typically, patients with myocarditis pale around the mouth can be blue, under the eyes — dark circles. When probing can be fast or slow heart rate, irregular heartbeat. If it joins severe heart failure, vybuhayut veins in the neck. In diffuse lesions of the heart conduction disorders symptoms align with the formation of severe and life-threatening arrhythmias — fibrillation, atrial flutter. Often in myocarditis detected beats, bouts of atrial fibrillation with a typical clinic. These symptoms disturb the blood circulation of the body and lead to the progression of heart failure with edema, tissue hypoxia. One-third of patients myocarditis occurs malosimptomno. The clinic can be lethargy and fatigue, which are blamed on asthenia after infection. Especially hard proceeds idiopathic (Friedler) myocarditis. When it occurs quickly cardiomegaly, severe cardiac arrhythmias, and circulatory failure progresses rapidly comes death. Myocarditis, especially the current long-term or recurrent, give serious complications in the form Cardiosclerosis, substitution of muscle connective tissue. In addition, there may be lasting consequences irreversible — arrhythmias, heart failure, especially of the left ventricle, sudden death syndrome. CT and MRI of the heart, radioisotope scanning, probing cavities of the heart. Acute myocarditis requires inpatient treatment with hospitalization for at least 1-2 months in the Department of Cardiology and Intensive Care with a translation in the cardiac chambers. Spend dietary correction with restriction of salt and fluids, enriched in proteins and vitamins to nourish the myocardium. the impact on the causes, especially if it is a microbial, viral, or fungal process. Assign specific chemotherapy drugs long course. Additionally conducted sanitation foci of chronic infection. pathogenetic treatment — the use of anti-inflammatory, antihistamine drugs, hormones, short courses or immunosuppressants. symptomatic drugs — this appointment potassium drugs, metabolic drugs for the heart muscle, antiarrhythmics, antihypertensive drugs physiotherapy.